The 70th Annual Golden Globe Awards nominations were announced this morning: /70th-annual-golden-globe-awards-nominations/CLICK HERE Among the nominees is Jon Bon Jovi for his original song 'Not Running Anymore' from Stand Up Guys. Starring Al Pacino, Christopher Walken, and Alan Arkin as grumpy old gangsters who decide to take on one last hit, the film opens in New York and Los Angeles this weekend, starting December 14th, before opening wide in February. 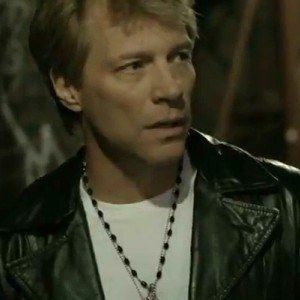 We have the music video for 'Not Running Anymore', which features Jon Bon Jovi sitting in the doorway of a church, remembering the time he went to see Stand Up Guys at his local New Jersey cinema.